Alison Barnes sets the record straight on who was really responsible for introducing this popular custom to Britain. Legend has it that Queen Charlotte’s compatriot, Martin Luther, the religious reformer, invented the Christmas tree. One winter’s night in 1536, so the story goes, Luther was walking through a pine forest near his home in Wittenberg when he suddenly looked up and saw thousands of stars glinting jewel-like among the branches of the trees. This wondrous sight inspired him to set up a candle-lit fir tree in his house that Christmas to remind his children of the starry heavens from whence their Saviour came. In other parts of Germany box trees or yews were brought indoors at Christmas instead of firs. And in the duchy of Mecklenburg-Strelitz, where Queen Charlotte grew up, it was the custom to deck out a single yew branch. The poet Samuel Taylor Coleridge (1772-1834) visited Mecklenburg-Strelitz in December, 1798, and was much struck by the yew-branch ceremony that he witnessed there, the following account of which he wrote in a letter to his wife dated April 23rd, 1799: ‘On the evening before Christmas Day, one of the parlours is lighted up by the children, into which the parents must not go; a great yew bough is fastened on the table at a little distance from the wall, a multitude of little tapers are fixed in the bough ... and coloured paper etc. hangs and flutters from the twigs. Under this bough the children lay out the presents they mean for their parents, still concealing in their pockets what they intend for each other. Then the parents are introduced, and each presents his little gift; they then bring out the remainder one by one from their pockets, and present them with kisses and embraces’. When young Charlotte left Mecklenburg-Strelitz in 1761, and came over to England to marry King George, she brought with her many of the customs that she had practised as a child, including the setting up of a yew branch in the house at Christmas. But at the English Court the Queen transformed the essentially private yew-branch ritual of her homeland into a more public celebration that could be enjoyed by her family, their friends and all the members of the Royal Household. Queen Charlotte placed her yew bough not in some poky little parlour, but in one of the largest rooms at Kew Palace or Windsor Castle. Assisted by her ladies-in-waiting, she herself dressed the bough. And when all the wax tapers had been lit, the whole Court gathered round and sang carols. The festivity ended with a distribution of gifts from the branch, which included such items as clothes, jewels, plate, toys and sweets. These royal yew boughs caused quite a stir among the nobility, who had never seen anything like them before. But it was nothing to the sensation created in 1800, when the first real English Christmas tree appeared at court. That year Queen Charlotte planned to hold a large Christmas party for the children of all the principal families in Windsor. And casting about in her mind for a special treat to give the youngsters, she suddenly decided that instead of the customary yew bough, she would pot up an entire yew tree, cover it with baubles and fruit, load it with presents and stand it in the middle of the drawing-room floor at Queen’s Lodge. Such a tree, she considered, would make an enchanting spectacle for the little ones to gaze upon. It certainly did. When the children arrived at the house on the evening of Christmas Day and beheld that magical tree, all aglitter with tinsel and glass, they believed themselves transported straight to fairyland and their happiness knew no bounds. Dr John Watkins, one of Queen Charlotte’s biographers, who attended the party, provides us with a vivid description of this captivating tree ‘from the branches of which hung bunches of sweetmeats, almonds and raisins in papers, fruits and toys, most tastefully arranged; the whole illuminated by small wax candles’. He adds that ‘after the company had walked round and admired the tree, each child obtained a portion of the sweets it bore, together with a toy, and then all returned home quite delighted’. Christmas trees now became all the rage in English upper-class circles, where they formed the focal point at countless children’s gatherings. As in Germany, any handy evergreen tree might be uprooted for the purpose; yews, box trees, pines or firs. But they were invariably candle-lit, adorned with trinkets and surrounded by piles of presents. Trees placed on table tops usually also had either a Noah’s Ark or a model farm and numerous gaily-painted wooden animals set out among the presents beneath the branches to add extra allurement to the scene. From family archives we learn, for example, that in December 1802, George, 2nd Lord Kenyon, was buying ‘candles for the tree’ that he placed in his drawing room at No. 35 Lincoln’s Inn Fields, London. That in 1804 Frederick, fifth Earl of Bristol, had ‘a Christmas tree’ for his children at Ickworth Lodge, Suffolk. And that in 1807 William Cavendish-Bentinck, Duke of Portland, the then prime minister, set up a Christmas tree at Welbeck Abbey, Nottinghamshire, ‘for a juvenile party’. By the time Queen Charlotte died in 1818, the Christmas-tree tradition was firmly established in society, and it continued to flourish throughout the 1820s and 30s. The fullest description of these early English Yuletide trees is to be found in the diary of Charles Greville, the witty, cultured Clerk of the Privy Council, who in 1829 spent his Christmas holidays at Panshanger, Hertfordshire, home to Peter, 5th Earl Cowper, and his wife Lady Emily. Greville’s fellow house guests were Princess Dorothea von Lieven, wife of the German Ambassador, Lord John Russell, Frederick Lamb, M. de la Rochefoucauld and M. de Montrond, all of whom were brilliant conversationalists. Greville makes no mention of any of the bons mots that he must have heard at every meal, however, or of the indoor games and the riding, skating and shooting that always took place at Panshanger at Christmas. No. The only things that really seem to have impressed him were the exquisite little spruce firs that Princess Lieven set up on Christmas Day to amuse the Cowpers’ youngest children William, Charles and Frances. ‘Three trees in great pots’, he tells us, ‘were put upon a long table covered with pink linen; each tree was illuminated with three circular tiers of coloured wax candles – blue, green, red and white. Before each tree was displayed a quantity of toys, gloves, pocket handkerchiefs, workboxes, books and various other articles – presents made to the owner of the tree. It was very pretty’. When in December, 1840, Prince Albert imported several spruce firs from his native Coburg, they were no novelty to the aristocracy, therefore. 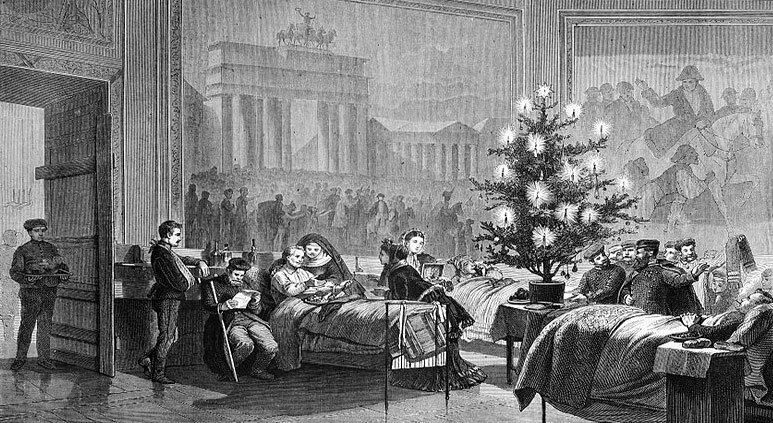 But it was not until periodicals such as the Illustrated London News, Cassell’s Magazine and The Graphic began to depict and minutely to describe the royal Christmas trees every year from 1845 until the late 1850s, that the custom of setting up such trees in their own homes caught on with the masses in England. By 1860, however, there was scarcely a well-off family in the land that did not sport a Christmas tree in parlour or hall. And all the December parties held for pauper children at this date featured gift-laden Christmas trees as their main attraction. The spruce fir was now generally accepted as the festive tree par excellence, but the branches of these firs were no longer cut into artificial tiers or layers as in Germany, but were allowed to remain intact, with candles and ornaments arranged randomly over them, as at the present day. Whatever their type or mode of decoration, Christmas trees have always delighted both children and adults alike. But perhaps no tree ever gave greater pleasure than that first magnificent Yuletide tree set up so thoughtfully by Queen Charlotte for the enjoyment of the infants of Windsor.